As we have managed to get an extention for the final payment of re-transplantation surgery. So, we are extending our campaign to gather more support. We appreciate everyone's participation. Hi, I am Manibhai J Gajjar, father of Jagruti Gajjar, hereafter referred as the patient. In our family there are six members including me, my wife Ramaben and our four daughters - Sheetal (31), Jagruti (27), Priyanka (25), and Ankita(21). Jagruti has been diagnosed in Global Hospital with “Acute Liver Failure”. As per doctors, Liver transplant is the only solution to save her. She is already admitted & the treatment has started in Global Hospital in Lower Parel, Mumbai. The Liver transplantation operation is already performed, but 4 to 5 days later, doctors suggested she be operated again to remove the several blockages in her liver. The total costing for whole treatment is expected to go beyond INR 35,00,000. Somehow we have managed INR 8,00,000. The remaining amount is yet to be paid. Since I am a retired Principal of Primary school & don’t have any other income source except pension, our financial condition is very weak. 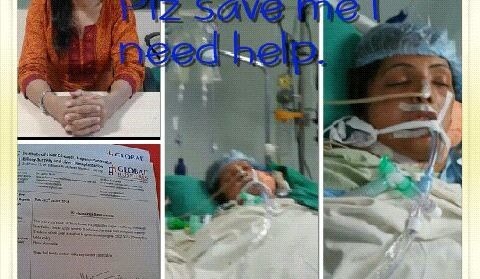 I request you to provide me financial help to save my daughter, Jagruti.